Imagine yourself flying down the steep decent of this rocky mountain river at high speeds. The splash of water on your face, the heart racing adrenaline navigating your way through crashing waves of water against the jagged rocks. Now imagine that instead of the dangerous river rapids, the water was a pile of money, sounds better doesn’t it? Well that is what you are looking at with the Rapid Reels Slot Online. As you may have noticed already, here at onlinefunslots.com we give all our slots characters names, so your tour guides down this soft and safe river bed of money are Jess and James. A happy cheerful couple on a life raft of excitement helping you make your way to winning big, not to mention James is also the face of the well sort after Wild symbol. 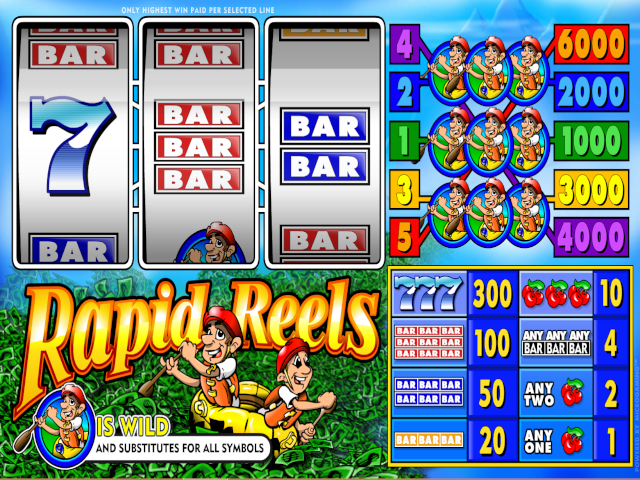 The main payouts of the Rapid Reels Slot Online is combinations of the wild in every direction with diagonals from bottom left of the first reel to top right on the third reel being the highest. Note: to get the maximum payouts, a player must play a 5 coin bet.